Jupiter, with a gorgeous location in Palm Beach County on Florida’s Treasure Coast, is renowned for its pristine beaches, fine hotels, golf, fishing, and parks. 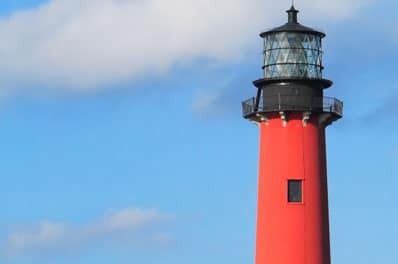 The most prominent landmark is the Jupiter Inlet Lighthouse. Jupiter residents have good reason to be happy, and Coastal Living rated it the 9th Happiest Seaside Town in America in 2012. All Points Medical Waste is proud to serve Jupiter. We have provided full-service document destruction here since 1994. When we began offering medical waste services here in 2013, we made it our mission to provide the best customer service and competitive rates. Jupiter medical waste generators can now have it all: total security and compliance for medical waste and confidential information. Proudly woman-owned and operated, All Points Medical Waste offers a full suite of medical waste disposal and compliance services to our clients, ranging from small to mid-sized medical waste generators. We will provide training for your employees on how to handle sensitive documents as well as assist you with your policies and procedures. We are more than just another document shredding company. Our All Points Medical Waste team is committed to being your full-service medical waste disposal experts. The law requires responsible disposal of medical waste, and we know how crucial it is to choose the right medical waste company for your needs. Did you know that you are responsible for the medical waste you produce from creation to disposal? We will properly transport and dispose of your medical waste and sharps, as well as providing online compliance training for Bloodborne Pathogens, MSDS, DOT, Safety Plans, HIPAA and more. We also offer on-site document shredding and hard drive destruction so you have a total security solution. At All Points Medical Waste, we are proud to employ drivers and customer care representatives who have served in the U.S. military. Each staff member is background-checked and regularly drug tested as a condition of employment. If you are interested in All Points Medical Waste services in Jupiter, please contact us by phone or complete the form on this page.